A new restaurant located underneath a dance club on Center Street, Old Towne Grill has a delicious menu and fun atmosphere. My sister and I lucked out and it was a beautiful evening outside, so we chose outdoor seating and enjoyed the ambience of a less-busy corner of Center Street. It was a surprisingly busy Thursday night at the restaurant - we were seated pretty quickly but some of the service was a bit slow, probably because the staff was still very new and it was a popular night. The menus are attached to large wooden boards, which is kind of cute, though awkward to actually hold up. Water was served in mason jars, but you can ask for straws, which makes it much easier to drink from. We started with the flash-fried artichokes. They were pretty intensely salty, but with a spritz of freshly-squeezed lemon juice and the lemon-garlic aioli that accompanied them, they were just right. 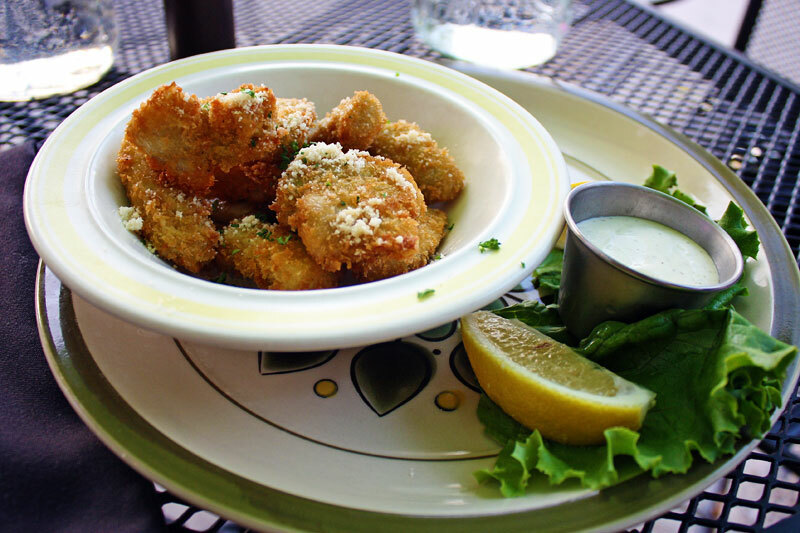 I've never had fried artichokes before, but they were a pretty good food to fry! It reminded me of that show "Can You Blend It?" but with frying food - "Can You Fry It?" It turns out that the answer to many foods, including artichokes, is yes! I ordered the chicken roulade, which was described on the menu as "stuffed chicken breast with asparagus, roasted red pepper, + mozzarella + vegetables + tortellini + basil cream sauce." As you can see from the picture above, my dish did not appear like a typical stuffed chicken breast - they had taken the liberty of cutting the chicken and arranging it on the plate, with the tortellini and vegetables surrounding it. Devynne was immediately turned off by this ("It's not stuffed chicken!") but I actually liked it. It was still like stuffed chicken in that I could get a taste of everything in one bite, but they saved me all of the work of man-handling an awkwardly large chicken breast. Plus it looked good on the plate! Everything was prepared deliciously, with a seasonal selection of vegetables that were so fresh and a heavenly basil sauce. The tortellini were a nice touch, and there were some bright red tortellini in the mix - I've never seen pasta with such vibrant color! 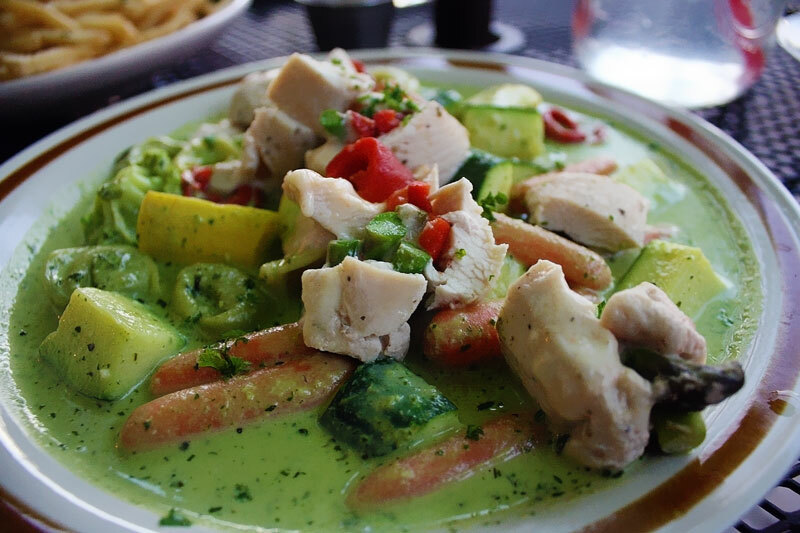 All in all, a delicious and hearty dish. Devynne's burger was, in one word, INTENSE. A huge patty served with melty blue cheese and FRIED bacon - yes, as if bacon wasn't unhealthy enough, they flash-fried it for good measure! Of course this was delicious, and the overall combination was sinfully gratifying. The bun was fresh and toasted, and even though Devynne mentioned that the blue cheese flavor wasn't very strong, we both agreed that it was one heck of a burger. It was served with a heaping pile of skinny fries - I think I may be jumping on the skinny fry boat soon, because these were fantastic! As if we hadn't eaten enough, we decided to go for a dessert as well. On the menu, our choice was described as a "brownie bottom pie," which sounded awesome and I could only imagine what the filling of such pie would be. Unfortunately, it was basically just a big brownie, very un-pie-like, but at least it was one of the most delicious brownies I've ever had! 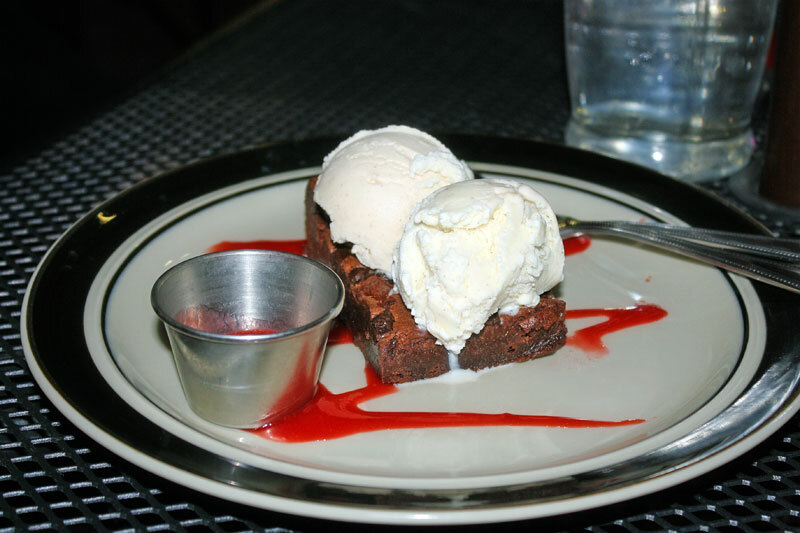 It was served with a scoop of vanilla ice cream (boring), cinnamon ice cream (unique and surprisingly good with the brownie), and raspberry sauce (which actually tasted like raspberries, not artificial flavors!) We inhaled it in 0.5 seconds, and were more than satisfied. 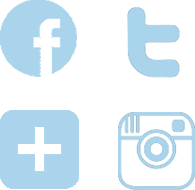 What You Should Do: Definitely give Old Towne Grill a try! 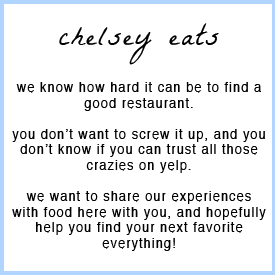 I would probably wait until they have been established a little longer so that the servers have more experience, or go at a time where they will not be very busy because our meal did take quite a long time and by the end of the night, it was dark outside and I'm pretty sure I got two bug bites. But the food was good and they have so many other things on the menu that I want to try! 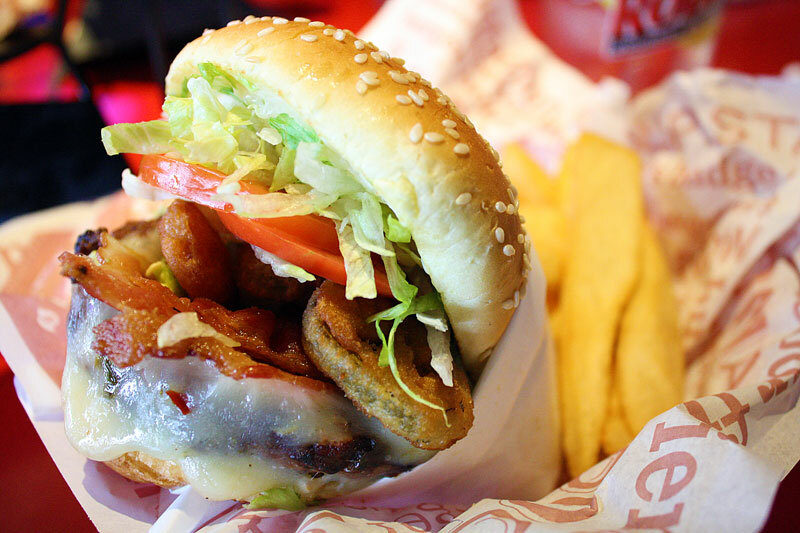 I've never really understood the whole Red Robin thing - I think people go there because it is a reliable place with usually friendly service and a menu where they know what they're going to get. I've never really been to Red Robin for anything other than a milkshake before, so I never realized before that they are actually not very cheap! $10 for a burger is more expensive than you'll pay at most places, including delicious choices like Cubby's, Legend's Grille, and JCW's, so I wanted to see if the meal was really worth the surprisingly high bill. 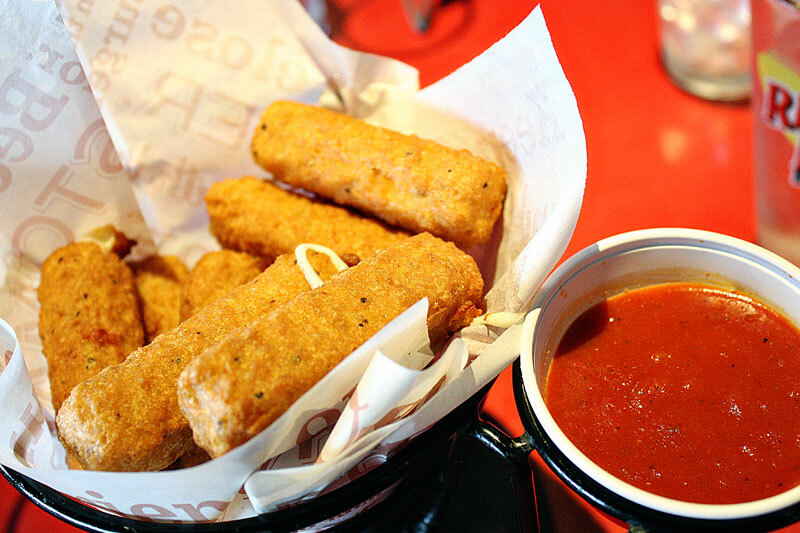 We started out with mozzarella sticks because hey, we were feeling pretty gluttonous, and you really can't go wrong with fried cheese. We only were able to eat a few since they were so intense, but they tasted like fried happiness and a future heart attack :) The marinara sauce it was served with was tasty, and it probably would have been a good appetizer to share with more people. Tim and Megan enjoyed their regular cheeseburger and chicken sandwich - not much commentary from them, but both seemed quite satisfied and Tim mentioned that the combination of honey mustard and guacamole (which I've never had before) was surprisingly good, and the wheat bun looked like a nice touch. Owen is obsessed with bacon jalapeño burgers with pepper jack, so he asked if they could add jalapeños to his bacon cheeseburger. It turns out that they cost an extra 90 cents to add an additional topping, which would have been nice to know before ordering, and they only had fried jalapeños (as opposed to regular), which was a little unhealthier than we anticipated but of course tasty and Owen liked how they kept in the heat. I don't really have any great pictures of the steak fries that were served with each of our burgers, but we really didn't want any of the "bottomless fries" offer after being so full from the burger! The fries weren't amazing, needed extra salt, but weren't awful either - just your average fried potato slices. 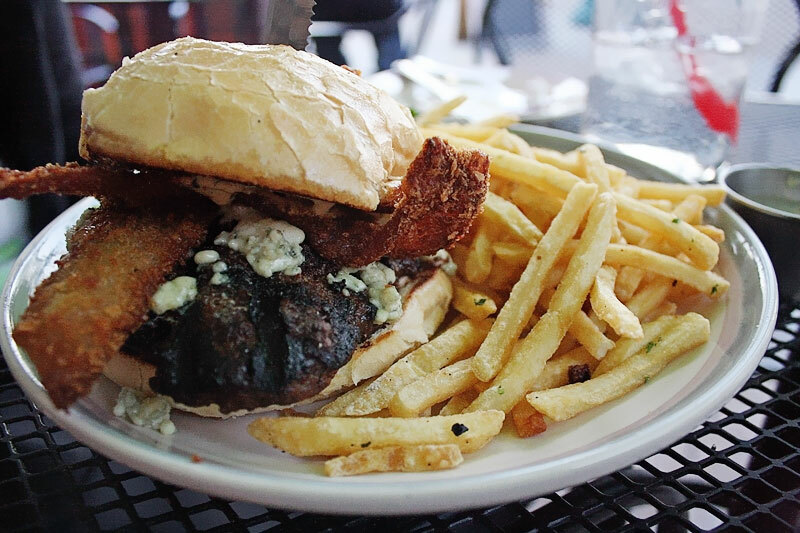 I ordered the Bleu Ribbon burger, which came with blue cheese and fried onions. The blue cheese flavor was really mild, which is probably good for most people, but I was hoping for a stronger presence. I liked the crunch of the fried onions and the onion & poppyseed bun, which was a nice deviation from a regular bun. I was a little disappointed with how charred the exterior of my burger was, and found that it was a bit overcooked and not juicy. We were going to see a movie right after dinner so I wanted to finish my whole meal and not take home any leftovers, which was a big mistake because I had a huge stomachache the whole rest of the evening. 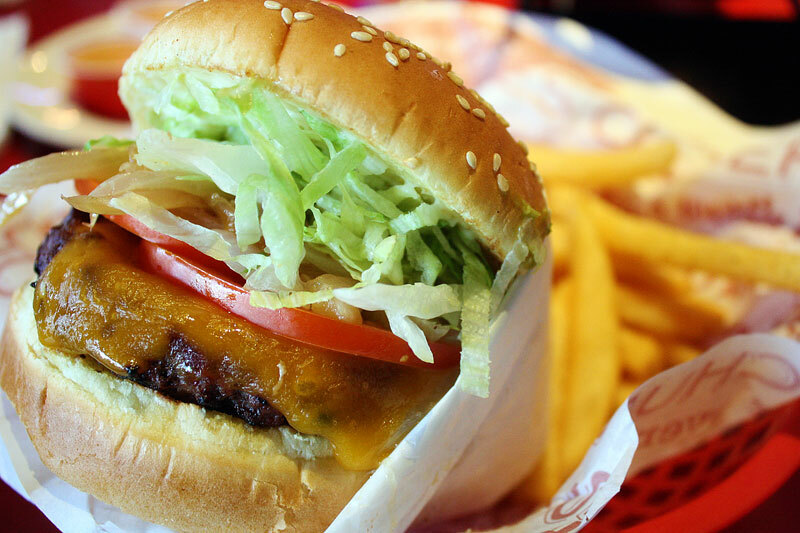 What You Should Do: The meals at Red Robin are very large and heavy, so I'd recommend either coming on a very empty stomach or planning to take part of your meal home. 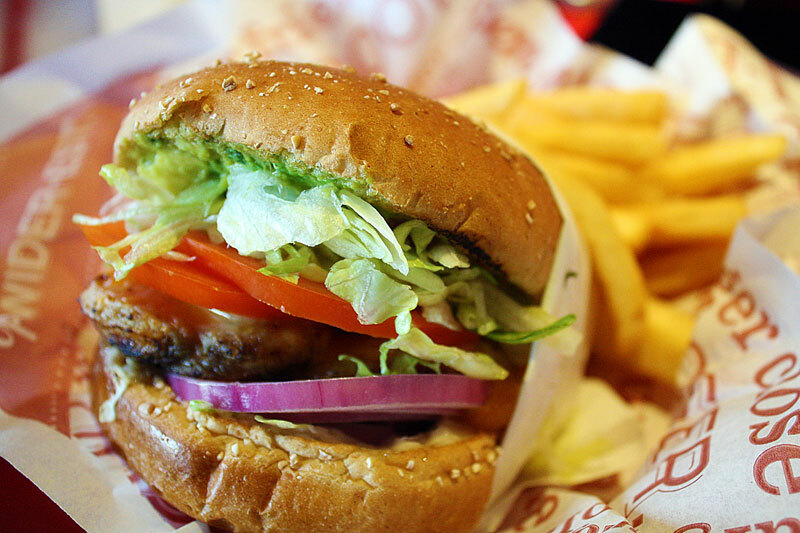 I think if I was to visit Red Robin again, I would order a grilled chicken sandwich because it seems like it would be a little lighter, and they have a couple of options. I felt like Red Robin was overpriced for a chain restaurant that serves typical burgers and fries, and even though in theory you could get all the steak fries you want included in that $10, I doubt many people go back for more than one refill because the rest of the food is so heavy. 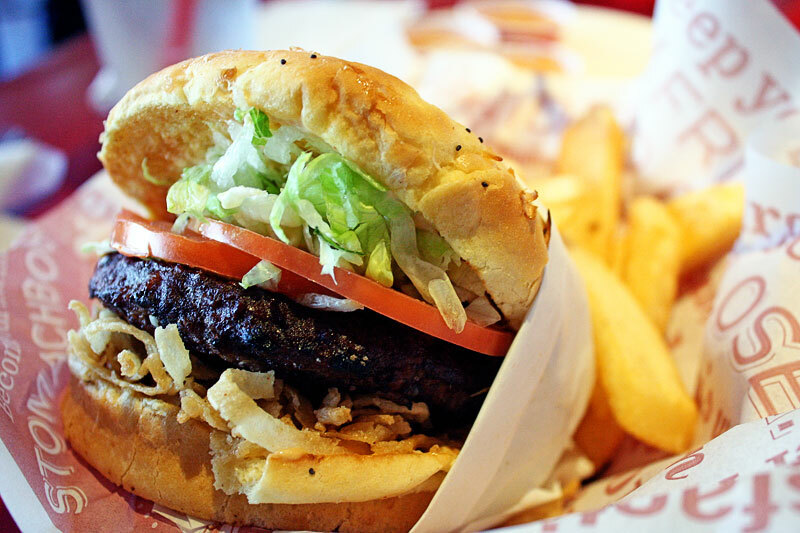 If you're a die-hard Red Robin fan, I'd recommend branching out and testing one of the other restaurants I mentioned - who knows, you may find something else you like! Why have I been wasting all my time this summer with frozen yogurt - I've totally missed out on the delicious awesomeness which is shave ice! 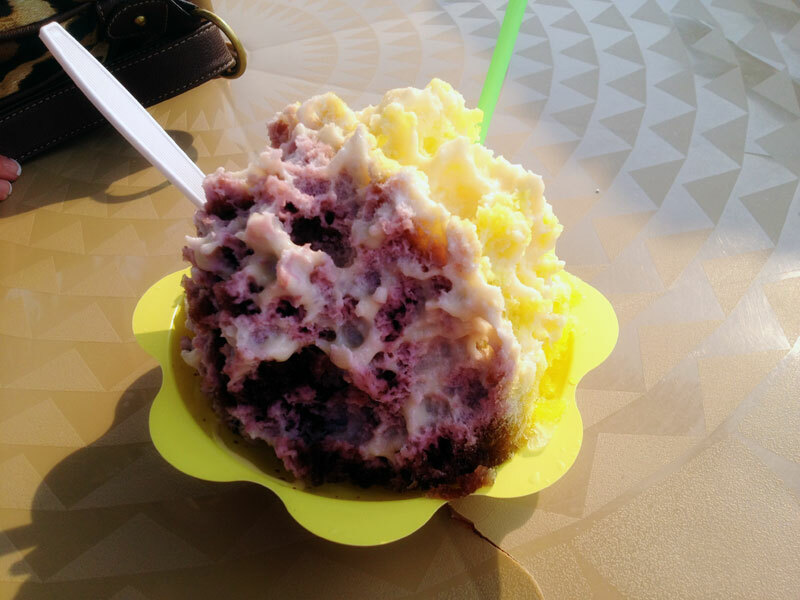 I've always had kind of a negative attitude towards shave ice since growing up my mother never let me buy it because she said it was just expensive water with sugar poured on top. Though this may be partially true, I cannot think of anything more refreshing than one of these delectable desserts on a hot, hot Utah day. 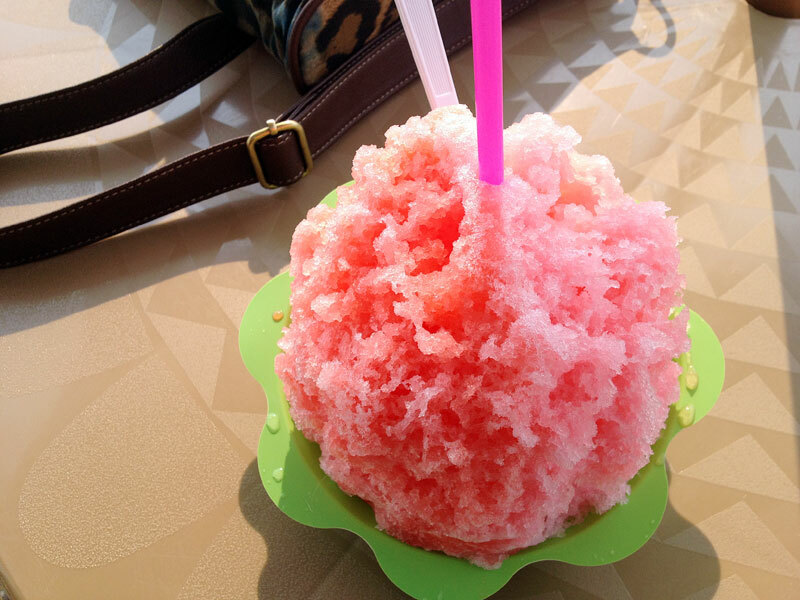 In the past, shave ice I've had was either too chunky or you run out of flavor in the first half and just end up eating plain ice by the end. No good. Hokulia makes shave ice the way it should be - finely shaved and melt-in-your mouth ice with rich, sweet, unique flavors. What You Should Do: Definitely make it over to this little shack of heaven before the summer ends! They are only open seasonally (sadly), so you'll have to go soon! They without a doubt have the best shave ice I've ever had - a classic taste of the shave ice you love, times like a million. Go Go GO! The battle of the "iguanas" in Salt Lake is a showdown of delicious Mexican food - Red vs. Blue with plenty of supporters on both side. Being true lovers of the Red Iguana, we decided that we needed to be fair and test out the Blue Iguana as well. Though I think we may still be on Team Red (awkward thing to say for a blog that's got BYU in the title...), the Blue Iguana proved to be a delicious alternative with shorter lines, a fun atmosphere, and tasty authentic Mexican food. Normally chips and salsa aren't that exciting, but I think that we have decided that the Blue Iguana has the best salsa of any Mexican restaurant we've ever been to! It has incredible flavor, with a great texture that isn't too thin or too chunky. 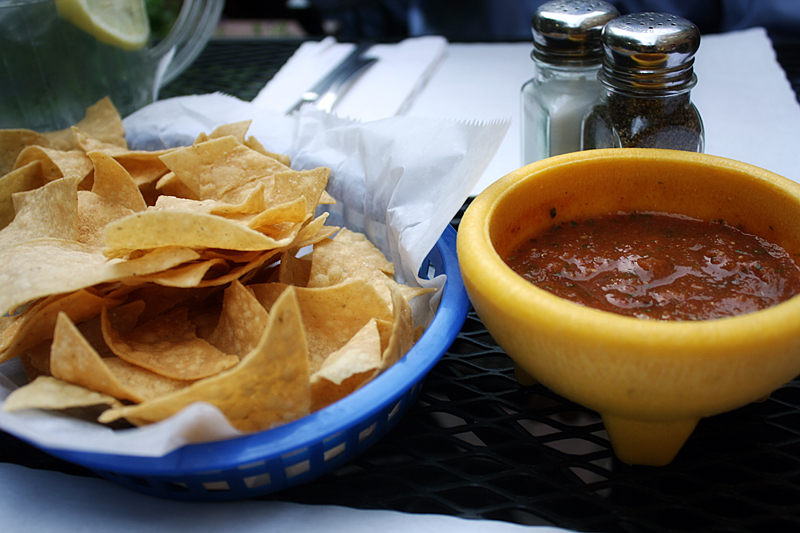 They give you a huge bowl of the salsa, and we were tempted to lick the bowl after inhaling it all in 5 minutes. I only wish that this salsa was available for purchase or something, because it really was the best salsa I've ever had. While placing our order, we were surprised to find out that the menu here at the Blue Iguana seemed to be nearly identical to that of the Red Iguana. Many of the moles were the same, they had a huge menu as well, and lots of the specialty items were really similar between the two restaurants. We decided to try to order foods that seemed unique to the Blue Iguana menu. Our second favorite part of the Blue Iguana was the huge pile of guacamole, sour cream, and fresh pico de gallo served on the side of each entreé. Owen's chicken burrito ahogado was smothered with a chile colorado sauce and cheese, which was incredibly tasty. It wasn't too spicy or too salty, and the free sour cream and guacamole were necessary and delicious compliments to this appetizing dish. There was pretty much just meat inside the burritos, but they were rolled loosely enough that you could add in whatever lettuce, pico, rice, beans, etc. that you wanted inside. The fajitas were served a little differently than I've had before - rather than serving the tortillas separate from the meat, the two fajitas were already assembled for me. Though this in theory could save some time for those who are super hungry and potentially prevent burn wounds from the hot, hot food, I actually had a hard time figuring out how to eat them, since the back side of the tortilla was covered with beans and rice, and they were hard to pick up. 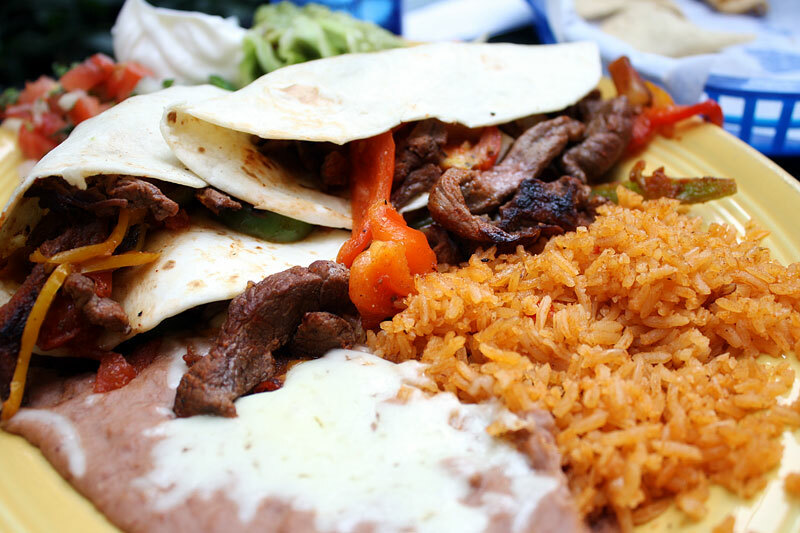 The flavor was really delicious - the "gringas" fajitas were full of savory charred steak, flavorful grilled peppers, and sweet tangy pineapple. But I couldn't figure out if I should use a fork, or just dump out the meat and roll it up like a normal burrito, hoping not to get refried beans all over my hands. 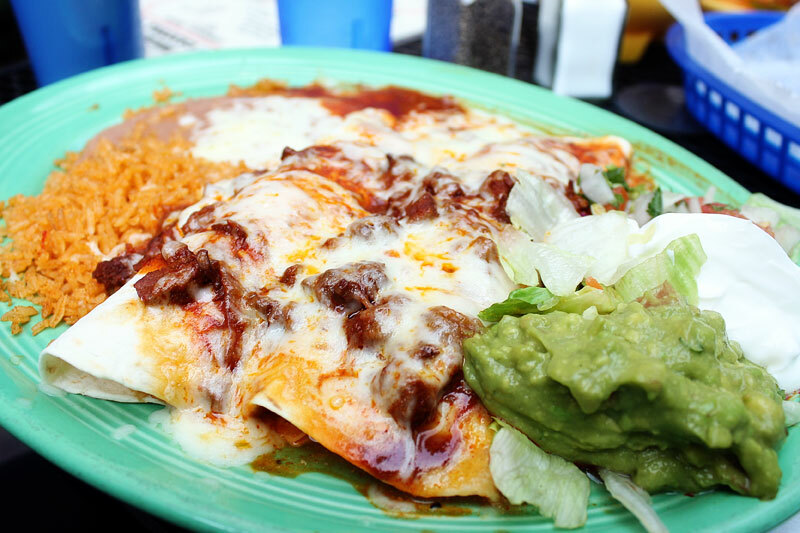 What You Should Do: If you're not interested in waiting in 45-min+ lines at the Red Iguana, the Blue Iguana is a gratifying substitute that usually is less busy. We liked the salsa and restaurant environment better at the Blue Iguana, but preferred the unique flavors (and those freakin' Tacos don Ramon) at the Red Iguana. Nonetheless, the food was still tasty, similarly priced, and they make a mean horchata as well!